To meet customer needs and provide valuable services, it is important to maintain a high quality of service, which in itself requires a well-structured approach to IT Service Management (ITSM). Existing approaches such as ITIL and the ISO/IEC 20,000 standard are useful but not always well suited to the challenges of providing cloud or other distributed services, especially federated environments. 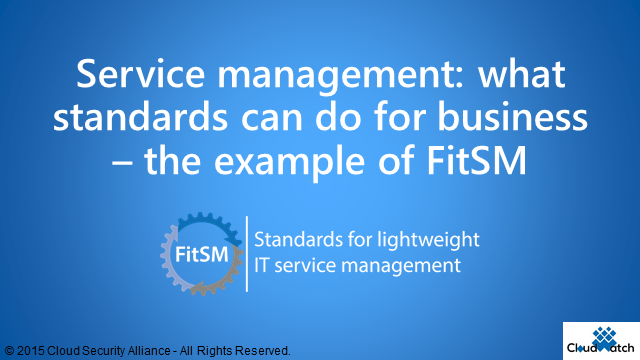 This webinar will provide a clear-cut view of the challenges for service management, and the FitSM standard, a new lightweight approach suitable for cloud, distributed, federated and research services. It provides requirements based on international standards and commercial best-practice, as well as concrete support in terms of templates, guides and tools useful in implementing ITSM. The webinar will be presented by the authors of FitSM as well as representatives of service providers implementing the standard. You should attend if you have an interest in implementable and actionable standards, especially if you are CIO in a big company, CEO of an SME, an academic.